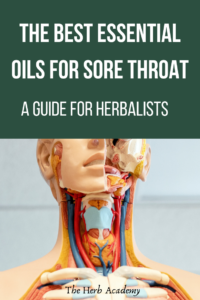 There are a number of essential oils for sore throat that the family herbalist can use to both help the body deal with the problem and to help prevent future sore throats. A sore throat is an indication of an impaired immune system. This results when the body is attempting to eliminate toxins, especially from the lymph system and the intestinal tract. 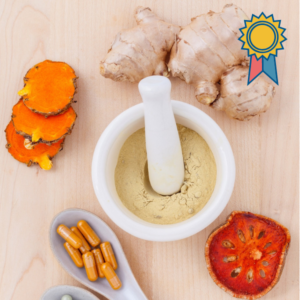 The family herbalist will first and foremost look at improving elimination and supporting the immune system to prevent future infections. Next we look at assisting the body to deal with the current infection. Treatment with essential oils is aimed at reducing pain and inflammation, killing the virus or bacteria, and uplifting the spirit which aids healing. Add essential oil to a teaspoon of honey. Dissolve the blend in 30 ml (2 tablespoons) of warm water. Gargle a small amount for 20 seconds and spit out. This blend is also effective for coughs. Blends oils and vinegar. Top up with 1 teacup warm water, then stir in 1 teaspoon honey. Gargle 2-3 times daily, but not swallow. Add essential oil to a small bowl of steaming water. Cover your head and the bowl with a towel, making sure that you are at a comfortable distance above the bowl. Inhale deeply with your nose, keeping your eyes closed. Raise the towel and exhale slowly through your mouth, then lower the towel and inhale deeply through your nose. Continue this procedure for 10 – 15 minutes or until the smell is gone. Use an essential oil diffuser (many types are available). Most rely on gentle heat to activate the essential oil. Make sure you follow the instructions of your diffuser. Use the diffuser with uplifting oils to lift the mind and spirit. Your doorway into the fascinating world of the family herbalist. 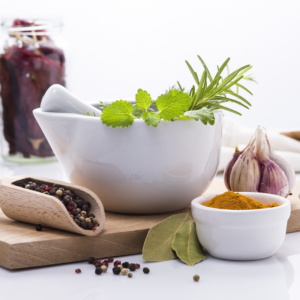 This short course is for you if you are interested in learning how to use herbs and natural medicine to treat everyday ailments and to live more healthy and naturally. It is also for you if you are interested in learning how to help others. A native of Indonesia, Tanzania, Madagascar and Ceylon. Two types of clove oil with similar characteristics are obtained from its blossoms and leaves through distillation. The blossom oil is more expensive and has a warmer, spicier, sweeter scent. By contrast, the leaf oil is not as fruity. Clove is very antiseptic and pain-relieving. Thus, the essential oil is used is many pain-relieving treatments. It’s scent is familiar to anyone who has been to the dentist. Cultivated in France, Spain and Russia. The essential oil is derived through distillation from the blossoms of the herb. It yields a thin light to yellowish essential oil. Clary sage has bitter, astringent and relaxing properties. Native to Australia but widely cultivated in the southern hemisphere. It was widely planted to dry out swampy ground, notably in Italy and California. An important timber species, used for the keels of ships in the 19th century. Widely used as a flavouring in pharmaceutical products and in spot removers for oil and grease. The essential oil is obtained from the leaves and small twigs. It is generally known for its strong antiseptic and healing effect on infections of the respiratory system. Lavender grows throughout the Mediterranean region as well as in England, Russia and Australia. The fresh stems and flower buds are used to make the essential oil. Lavender essential oil is antibacterial, pain-relieving, healing for wounds, soothing for skin diseases, deodorizing, antiseptic, fungicidal, rejuvenating and anti-inflammatory. Headaches disappear with cold lavender compresses. In addition Lavender strengthens the effects of other oils when used in blends. This familiar herb is grown worldwide. Its thin, clear essential oil is derived from the herb through distillation. It contains menthol, a crystalline substance that is known for its ability to open the breathing passages. Its slightly antiseptic, anti-inflammatory and toning properties are of use in treating sore throat. Essential oils with pain killing (analgesic), anti-inflammatory and anti-microbial properties will all be helpful in treating sore throat. Bergamot, Clary Sage, Eucalyptus, Geranium, Ginger, Lavender, Lemon, Peppermint, Pine, Sandalwood, Tea Tree. Clary Sage, Eucalyptus, Frankincense, Lavender, Lemon, Sandalwood. 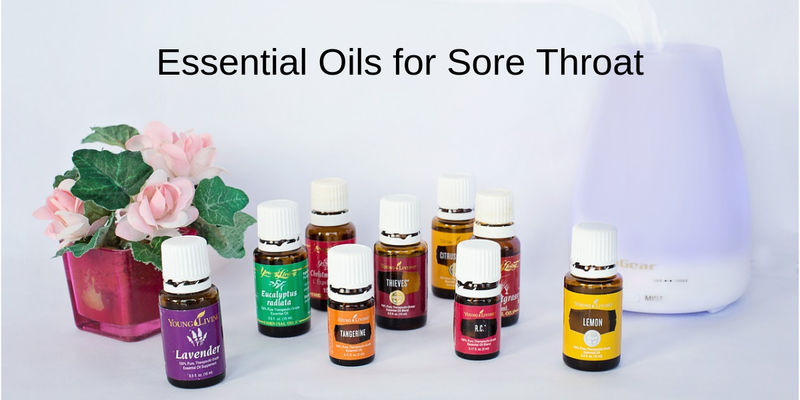 Do you use essential oils for sore throats? Please share your experience in a Reply below. I will definitely try these remedies. We use sweetroot for sore throat, it works very well. I am going to get the oils that you mentioned, that I do not have. this winter is going down!! I like the essential oil gargle blend for sore throat. I have all the essential oils listed. I have used them in a diffuser, and Lavender on a tissue in the bedroom. I will try therm in a gargle and as a massage oil.